Delightful 2 bedroom waterfront apartment! Property 20: Delightful 2 bedroom waterfront apartment! Breathtaking view from your beach-side balcony. Property 30: Breathtaking view from your beach-side balcony. 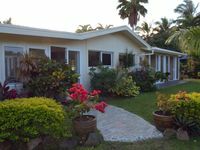 Property 40: LeoMae Rarotonga. Stunning home in Titikaveka.